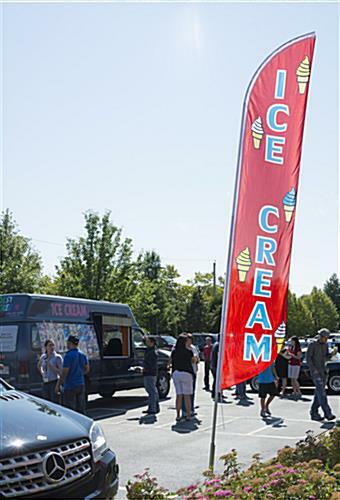 This stock message "ICE CREAM" display flag is a 14' concession advertising fixture with a brightly colored pre-printed banner and outdoor ground stake base. 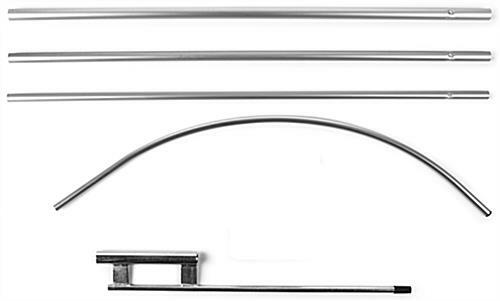 The multi-section aluminum post is easy to assemble and take apart as needed. Each eye-catching "ice cream" display flag attracts customer attention with brightly colored graphics and easy to read text. The ground stake base is designed for outdoor use in soft ground, sand, grass, snow or turf. This high visibility "ice cream" display flag is an economical way for specialty or convenience stores, concession stands and food vendors to advertise frozen treats for sale. The brightly colored red polyester banner features bold blue text and graphics to attract customers.